The phase of the moon is how much of the moon appears to us on Earth to be lit up by the sun. Half of the moon is always lit up by the sun, except during an eclipse, but we only see a portion that's lit up. This is the phase of the moon. What are the different phases of the moon? As the moon orbits or circles the Earth, the phase changes. We'll start with what is called the New Moon phase. This is where we can't see any of the lit up side of the moon. The moon is between us and the sun (see the picture). As the moon orbits the Earth we can see more and more of the lit up side until finally the moon is on the opposite side of the Earth from the sun and we get a full moon. As the moon continues to orbit the Earth we now see less and less of the lit up side. The New Moon and Dark Moon are pretty much the same phase happening at almost the same time. 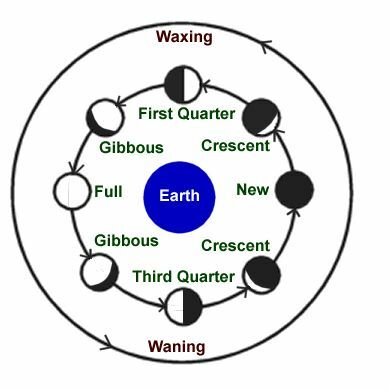 As the New moon begins its orbit and we see more and more of the moon, this is called Waxing. After the moon gets to its Full phase, we start to see less and less of the moon. This is called Waning. A lunar calendar is one based on the orbit of the moon. A lunar month (29.53 days) is slightly shorter than an average standard month (30.44 days). If you only had 12 lunar months then you would end up around 12 days short of a year. As a result very few modern societies use a lunar calendar or month. However, many ancient societies measure their time in lunar months or "moons". A lunar eclipse is when the Earth is exactly between the Moon and the Sun so none of the Sun's rays can hit the moon. A solar eclipse is when the moon exactly blocks the Sun's rays from hitting the Earth. A lunar eclipse can be seen from anywhere on the dark side of the Earth. A solar eclipse can only be seen from certain places on Earth as the moon only blocks the sun for a small area. Solar Eclipses always happen during the new moon phase.